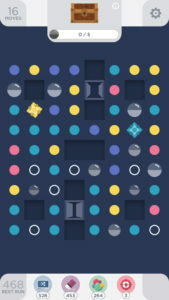 Two Dots is just a flawless delight of a puzzle game. It’s simple and perfectly balanced and has wonderful graphics. The aim is to match dots, and if you can match them in squares, better still. “If in doubt, make squares” is the philosophy – though this doesn’t actually hold true for every level’s mechanics. There is so much content here. There are 1,310 main game levels at the time of writing this. It’s possible to get 3-stars on every level raw/without tools. There are also two different weekly contests. Tools can be bought or won. 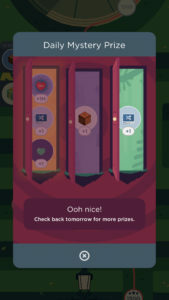 There’s a pick-the-door daily bonus where you can win tool(s) or an extra life, or occasionally a 1-hour infinite lives session. And it’s 100% free. The IAP is totally optional, but if you do want to show support, there are nice perma-IAPs such as a permanent extra life. You can also watch videos every so often to recharge a life. The graphics are amazing. The background to the level tree is all animated, and you’ll scroll up and down just to see stuff move: animals appear, trains run across the tracks, blossom falling, etc. I took some screenshots because the basic ones on iTunes just don’t do this app justice. The official site does offer some of the graphics as beautiful free wallpapers.